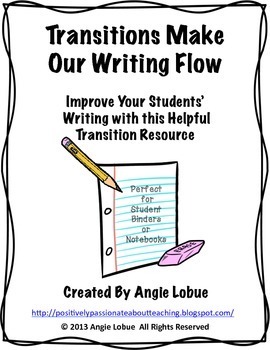 Do you teach your students "transitions make your writing flow?" 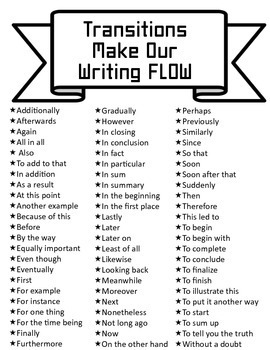 This helpful resource is a handy tool to include in writing notebooks, folders, or binders. It's a quick reference to some of the most common transitions used. If you download this resource, please leave much appreciated feedback. Thank you! Did you know? If you leave feedback, you’ll receive TpT credits to be used on future TpT purchases. What a deal! If you want more handy reference sheets, check these out! • Please go to your My Purchases page. Beside each purchase you'll see a Provide Feedback button. Simply click it, and you will be taken to a page where you can give a quick rating and leave a short comment for the product. I truly value your feedback. • Look for the star near the top of any page within my store, and click it to become a follower. You will then receive customized email updates about my new products.